Although cancer was known to the ancients – the oldest known description of the disease is in an Egyptian papyrus from around 1600 B.C. – cancer treatment in the 19th century had not advanced much beyond the methods used during the time of Hippocrates (circa 460-370 BC). These consisted of diet, bloodletting and laxatives. 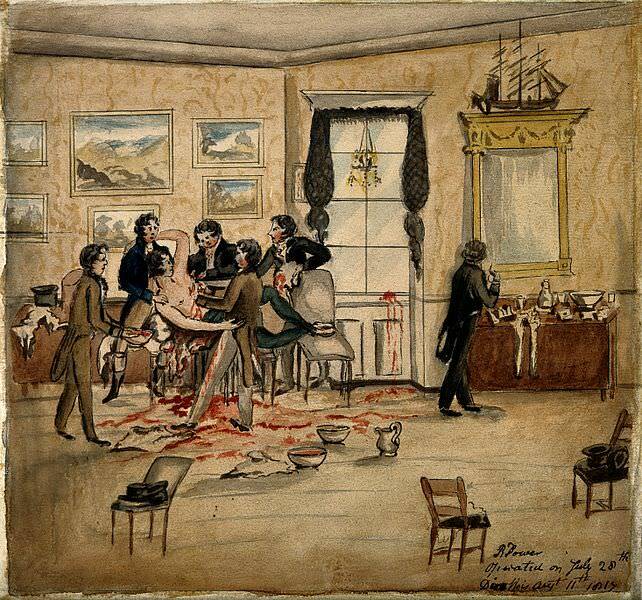 Surgery was also used to treat cancer, but since general anaesthesia was not available until the 1840s, and antiseptics were not broadly introduced until the 1860s, operations were extremely painful and had a poor prognosis. Like today, cures for cancer were often proclaimed, each with their advocates and testimonials. Yellow dock is a herb traditionally used as a medicine by Native Americans. Its root is recommended by herbalists as a general health tonic, as a remedy for mild anemia and various skin conditions, and as a laxative. In the early 1800s, dock root was one of many plant-based concoctions claimed to be successful in treating cancer. Take the narrow-leafed dock root and boil it in water till it be quite soft, then bathe the part affected in the decoction as hot as can be borne, three or four times a day; the root must then be mashed and applied as a poultice. This root has proved an effectual cure in many instances; it was first introduced by an Indian woman who came to the house of a person in the country who was much afflicted with a cancer in her mouth…. The Indian went out and soon returned with a root, which she boiled and applied as above, and in a short time a cure was effected…. Figs were another recommended cancer treatment, both (one assumes) because of their laxative effect, and because a fig poultice was thought to have healing properties – something that is mentioned in the Bible (Isaiah 38:21). Although poisonous, lead was used as a medicine for some 2000 years. Combined with brimstone (sulphur) and injected into the tumour, it was touted as a cancer treatment in the 19th century. Melt as much lead as would make a large rifle bullet, and while boiling over the fire stir brimstone in it until it becomes a fine flour, and the lead disappears; then scarify the top of the cancer, so that the powder, thus formed by the lead and brimstone, can get at the roots of the cancer; then cover it with a linen rag, and keep it dry, apply it once or twice a day, as occasion may require, until the cancer is cured. Napoleon’s famous battlefield surgeon, Dominique Jean Larrey, also applied his skill to the treatment of cancer. One suspects the following operation was more painful than reported (see Frances Burney’s account of her mastectomy conducted by Larrey). Mesmerism, also known as animal magnetism, was a popular 19th century therapy that involved the rebalancing within the body of an invisible force or fluid that was said to permeate the universe. Mesmerism combined aspects of hypnotism and healing touch. By the 1870s, electricity was being applied to tumours. How many patients were cured? This did not stop people from getting rich peddling cures. In 1885, an American paper complained. Napoleon Bonaparte died of stomach cancer on May 5, 1821, at the age of 51. (10) During the last four months of his life, Napoleon’s symptoms were treated with enemas, hot baths, valerian, iron, quinine, orange flower water, bloodletting, Cheltenham salts, licorice water, emetics, soup and semolina, hot towels, purgatives, barley water, tincture of opium and ether, jelly and warm wine, sulphate of magnesia, gentian, subcarbonate of potash, ether, calomel, and stomach plasters. Napoleon was not subjected to surgery or more exotic treatments, in large part because his physician, Dr. François Carlo Antommarchi, did not accurately diagnose his patient’s illness. Antommarchi thought Napoleon was suffering from chronic hepatitis. British Army surgeon Dr. Archibald Arnott did not make a correct diagnosis either. So how could Napoleon survive his fictional rescue from St. Helena and live beyond May 1821 in Napoleon in America, given that he was dying of cancer at the time? While I do not subscribe to the theory that Napoleon died of arsenic poisoning (see footnote 10 below), I took advantage of it when writing the novel by assuming that if Napoleon had been spared the final doses, he might have recovered. Such are the joys of fiction. “A Safe and Efficacious Remedy for the Cancer,” Maryland Gazette (Annapolis, MD), Feb. 5, 1801. “Cure for the Cancer,” The Lancaster Gazette, and General Advertiser (Lancaster, UK), Dec. 28, 1811. “Cure for the Cancer (From the Liverpool Courier),” Maryland Gazette and Political Intelligencer (Annapolis, MD), Aug. 24, 1815. Daniel Dillon, “Cure for a Cancer (From the Ohio Galaxy),” Maryland Gazette and Political Intelligencer, Aug. 1, 1822. “Cure of Cancer,” Bell’s Life in London and Sporting Chronicle (London, UK), Issue 238, Sept. 17, 1826, p. 293. “Cancer Cured by Mesmerism,” Woolmer’s Exeter and Plymouth Gazette (Exeter, UK), Oct. 21, 1848. Daily Central City Register (Central City, CO), Oct. 18, 1870. “Hospital for Cancer,” Cambridge Independent Press (Cambridge, UK), June 24, 1854. “Cancer-Cure and Cancer-Curers (From the Medical Record),” Daily Evening Bulletin (San Francisco, CA), May 9, 1885. The claim that Napoleon was killed by arsenic poisoning has been convincingly refuted in a number of scientific studies. See, for example, William J. Broad in the New York Times and Ted Chamberlain on the National Geographic website. For more about Napoleon’s stomach cancer, see UT Southwestern Medical Center, “Napoleon’s Mysterious Death Unmasked,” Science Daily, 16 January 2007, sciencedaily.com/releases/2007/01/070116131630.htm and Alessandro Lugli et al., “Napoleon Bonaparte’s gastric cancer: a clinicopathologic approach to staging, pathogenesis, and etiology,” Nature Clinical Practice Gastroenterology & Hepatology, Vol. 4 (2007), pp. 52-57. http://www.nature.com/nrgastro/journal/v4/n1/full/ncpgasthep0684.html See also J. Thomas Hindmarsh and John Savory, “The Death of Napoleon, Cancer or Arsenic?” Clinical Chemistry, Vol. 54, No. 12 (December 2008), pp. 2092-2093. http://www.clinchem.org/content/54/12/2092.full For a study of Napoleon’s case presented as a modern clinicopathologic conference, see Robert E. Gosselin, “Exhuming Bonaparte,” Dartmouth Medicine, Vol. 27, No. 3 (Spring 2003), pp. 38-47, 61. Real horror stories. Today you can GOOGLE the information, get a 2nd or 3rd opinion, calculate the cost of diagnosis and treatment, make better choices. How true, John. We are so much more fortunate today. Thanks for an interesting article. Could the controversy be finally settled by examination of the remains? Who has authority to grant this? Thanks, Addison. The French government would have to grant permission to open Napoleon’s tomb, and there would probably also have to be agreement by a representative of the Bonaparte family. In 2002, the French Ministry of Defence turned down a request to open the tomb and test the body’s DNA. See: http://www.telegraph.co.uk/news/worldnews/europe/france/1404678/France-blocks-DNA-test-on-Napoleons-body.html. What a fascinating and informative article. Thank you! Cancer quacks will thrive, because man wants to live, because hope will not die and because the diagnosis of cancerine from other tumors is not always easy.